Attorney General Basil Williams (centre) flanked by members of Guyana’s delegation at the CFATF Plenary and Working Group meeting. Guyana intends to scrap the idea of having an Anti-Money Laundering and Countering of Financing of Terrorism Authority because government has widened the involvement of wide variety of agencies in the system to detect and pursue financial crimes, Attorney General Basil Williams said Wednesday. “That was over-kill. Why would you put such a heavy superstructure over FIU (Financial Intelligence Unit)? That is only element. They collect suspicious transactions, report threshold reports and they do the analysis,” he said, adding that unit then passes information on to the Special Organised Crime Unit of the Guyana Police Force, and the Director of Public Prosecutions Chambers. Before winning the May 2015 general elections, A Partnership for National Unity (APNU) and the Alliance For Change (AFC) had vehemently insisted on the establishment of that oversight authority to appoint the FIU, but now Williams said there is no need for such a body which the law requires be established with the approval of parliamentarians. He said government would possibly be returning to the National Assembly to repeal that section of the Anti-Money Laundering and Countering of Financing Terrorism (AML/CFT) legislation. The coalition has a one-seat majority in the House to pass legislation. “We’ll have to probably repeal it because it’s otiose. It’s a waste of time,” he told Demerara Waves Online News on the sidelines of the 46th Plenary and Working Group meetings of the CFATF. The Attorney General explained that prior to his assumption of office Guyana’s Financial Intelligence Unit (FIU) had been the only entity attending meetings of the Caribbean Financial Action Task Force (CFATF) and other bodies. He said he later realised that the Central Bank is the largest supervisory authority. Williams said instead of the Anti-Money Laundering and Countering of Financing of Terrorism Authority that is required by the amended law, Guyana needs the Authority that he has established and also made up of the FIU, Bank of Guyana and the Guyana Revenue Authority (GRA). 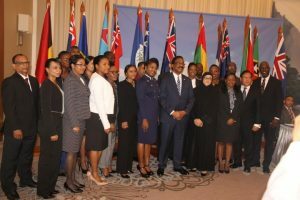 Guyana’s delegation at the CFATF meeting numbered 30 persons, in contrast to one person for several previous years. CFATF Chairperson, Rondalee Braithwaite-Knowles remarked that the Guyana Attorney General “has garnered support around him from a very large team made up of officials from public sector agencies and stakeholders. “For many years, Guyana was represented in the CFATF only by one person and in order for your jurisdiction to have an effective approach to the anti-money laundering regime, a jurisdiction needs to ensure that you have the cooperative and collaborative working of all of the relevant stakeholder agencies,” she said. The opposition People’s Progressive Party (PPP) late last week questioned why government has not established the Authority after refusing, while in opposition in 2014, to agree to amendments of the Act unless that mechanism had been included. “The names of persons for the Authority have been sitting there since June-July so how you are having these fine statements,” said Opposition Chief Whip, Gail Teixeira. She said the FIU Director has written to the parliamentary committee since July, 2017 appealing for the lawyer and accountant to be appointed.